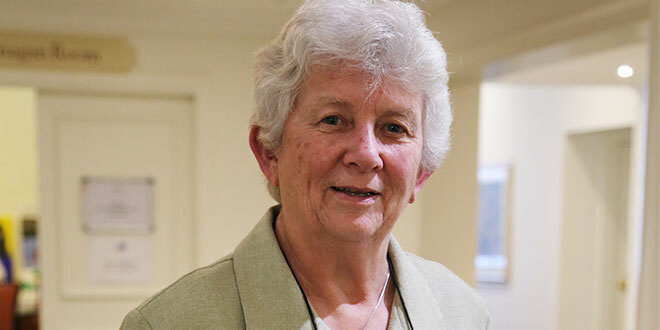 JOSEPHITE Sister Susan Connelly has described as “an enormously Eucharistic moment” her “arrest” in Prime Minister Malcolm Turnbull’s electoral office in Sydney on August 29. Sr Connelly was one of seven religious leaders who refused police orders to leave the PM’s office while they staged a prayer protest over offshore detention centres. Six pastors and Sr Connelly carrying a large crucifix entered the office and began a five-hour vigil reading from the scriptures, praying, singing and reading out incident reports from the Nauru files, which are leaked documents from inside the immigration detention system. “It was a lament – asking for a change of heart for Australians, hope for the people… and particularly a change of heart for Malcolm Turnbull,” Sr Connelly said. The protesters included NSW Ecumenical Council president Reverend John Barr. There were ministers from the Uniting, Baptist and Anglican churches. “We were asked four or five times whether we would leave, and we said no,” Sr Connelly said. “The police said, ‘That’s an offence and you’ll have to come with us’. There was one policeman for each person. They were most courteous. Sr Connelly said if she was fined over the incident she would refuse to pay, would go to court and was even prepared to go to jail.